Plot: A small local Vermont police station tries to outwit the state police and keep their jobs. Get's better everytime I watch it. I adore the acting, the setting, the plot and the shenanigans. Not my normal fare but hilarious nonetheless. Without a doubt my favorite part of the movie is the opening. This movie is perfectly executed with the plot and actors it was given. It is one of those cheaply made comedy movies. It has its cheap laughs, but it doesn't matter because the characters make it work. I am surprised there hasn't been more comedy movies about a whole station of standard police. It is a fresh alternative to the comedy detective movies. It was hilarious and make you think to become a cop. A must-see for all. 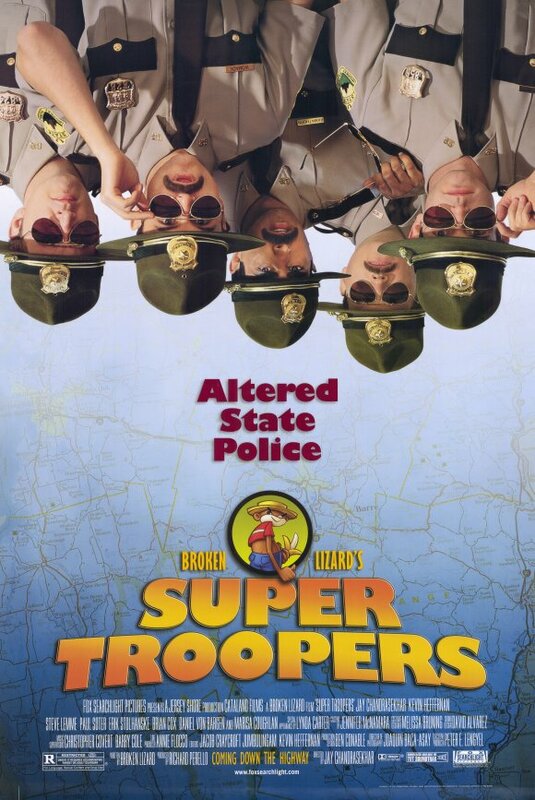 Riding high on the improvisational skill and natural chemistry of the Broken Lizard comedy team, Super Troopers is a pleasantly funny and often smartly satirical look into law enforcement. It's sort of a raunchier, more updated version of Police Academy, but, in my opinion, much funnier. No posts have been made on this movie yet. Be the first to start talking about Super Troopers!